Today I'm sharing with you my latest beauty purchases which are mostly drugstore. I mentioned in this post how much I'd been loving Simple face products so I had to shop more of them whilst they were on offer. I bought more of the Micellar Cleansing Water and their Hydrating Light Moisturiser. Whilst I was in the drugstore I passed the shelf with dry shampoo and I just remembered that I needed some ASAP as my other one just ran out. 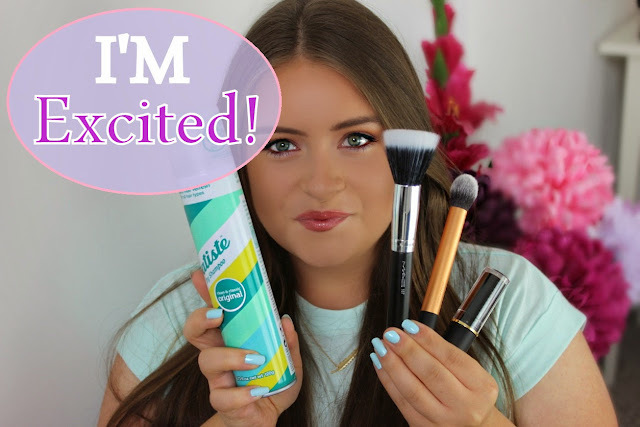 As a beauty vlogger I film a lot on the spot, so dry shampoo definitely needs to be on-hand. I decided to try a different brand for a change and went for Batiste which I have never tried before and I'm very excited to try in out. I also picked up a few new brushes for foundation (MAC) and contouring which I have never tried before and I also got a foundation/pan stick to contour with using my new Real Techniques contour brush. Yum cant wait to try some of those beauty products! BTW Love the vid so cute! Awesome haul, lady! I have that MAC brush and I love it! SUCH great beauty haul! I can't wait to hear your review on the dry shampoo - I am always looking for a great brand! You're so pretty! Nice finds... I love the light blue polish in your video!! Aw Thank you so so much Amber. I'm sure the nail polish is Essie 'mint candy apple'.